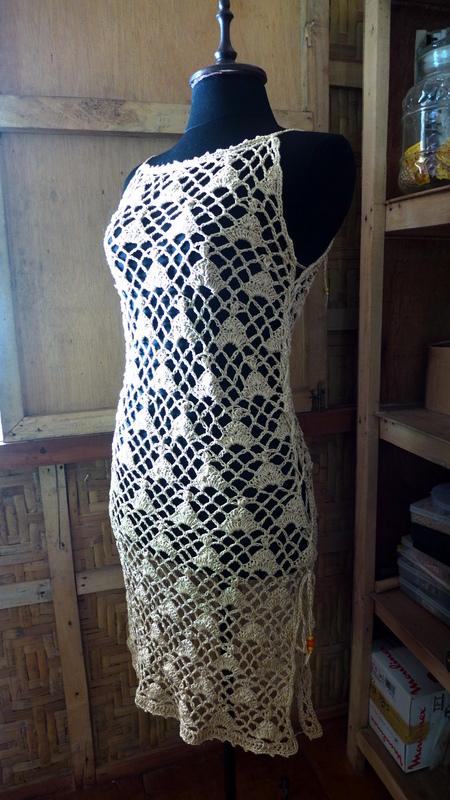 Crochet this allover lace garment to wear over a light sheer dress for summer and spring. The pattern works up quickly, employs simple shaping and the garment can be adjusted to fit a range of sizes via the ties along the sides and the adjustable shoulder straps. Make the Lace Up Overdress longer. Make it shorter to make a top. 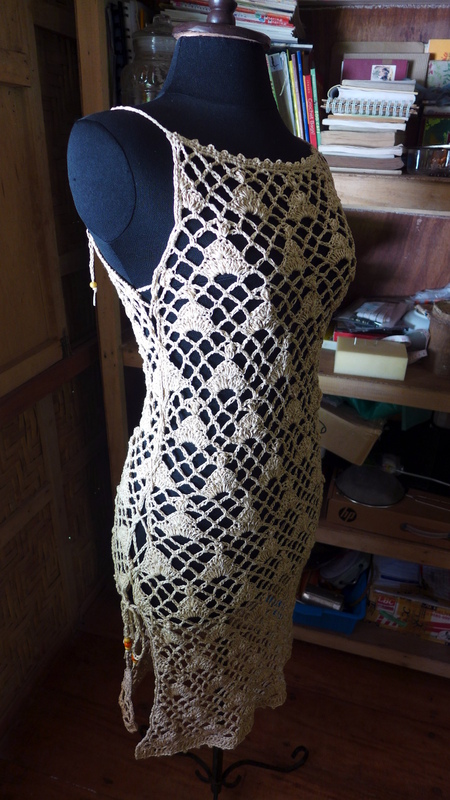 Can also be worn as a beach cover-up. Instructions include modifications to make a shorter dress, a longer dress and a top. Enjoy! Substitute yarn with Fine Weight yarn in cotton, acrylic, bamboo, or blends in solid colour, at least 984 yards / 900 meters. Notions: 12 pcs wooden beads to decorate the shoulder and side ties. To make a shorter dress: crochet Rows 1-22, ending Row 22 with sc in third ch of 5-ch turning ch, ch 1, turn. Continue to Rows 33-42, ending last row with ch 1, turn. Then finish off with Rows 63-73, making a total of 43 rows. 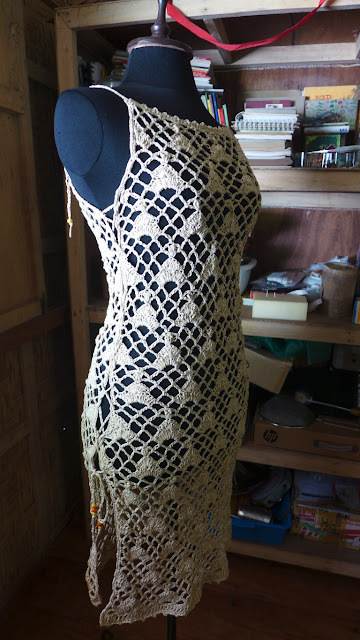 To make a longer dress: crochet Rows 1-12, then continue with reps of Rows 3-12 until you have 42 rows, ending Row 42 with sc in third ch of 5-ch turning ch, ch 1, turn. Then continue by following the pattern from Row 33 onwards, making a total of 83 rows. To make a top: crochet Rows 1-12, ending Row 12 with sc in third ch of 5-ch turning ch, ch 1, turn. Continue to Rows 33-42 ending last row with ch 1, turn. Then proceed to Rows 63-73, making a total of 33 Rows. Lace Up Overdress is crocheted in two pieces, front and back. Work commences at the bottom and proceeds to the top, in rows, shaping the waist and armholes along the way. Edging is worked all around the piece. Ties are crocheted separately and woven along the sides joining front and back pieces together. Shoulder straps are crocheted from the front and tied at the back. Rows 38 – 57: Rep Row 3-12. Row 58 – 62: Rep Rows 3-7. End Row 62 with ch 1, turn. Row 63: Sl st in 2-ch sp, ch 3, 2 dc in same 2-ch sp, sc in next 5-ch lp, *ch 5, sc in next 5-ch lp, 11 dc in next 5-ch lp, sc in next 5-ch lp, rep fr * across, end with ch 5, sc in next 5-ch lp, 3 dc in 5-ch turning ch, ch 1, turn. Row 64: Sc in first dc, *ch 5, sc in next 5-ch lp, ch 5, sk 2 dc, sc in next dc, sk 2 dc, 7 dc in next dc, sk 2 dc, sc in next dc, rep fr * across, end with ch 5, sc in next 5-ch lp, ch 2, sk 2 dc, dc in top of 3-ch turning ch, ch 1, turn. Row 65: Sc in 2-ch sp, ch 5, sc in next 5-ch lp, *ch 5, sk 3 dc, sc in next dc, [ch 5, sc in next 5-ch lp] twice, rep fr * across, end with sc in third ch of last 5-ch lp, turn. Row 66: Sl st in each of next 2 ch, ch 1, sc in same 5-ch lp, ch 5, sc in next 5-ch lp, *ch 2, 3dc-CL in next sc, ch 2, sc in next 5-ch lp, [ch 5, sc in next 5-ch lp] twice, rep fr * across, end with ch 5, sc in third ch of last 5-ch lp, ch 5, turn. Row 67: *Sc in first 5-ch lp, ch 5, sc in top of next 3dc-CL, [ch 5, sc in next 5-ch lp] twice, rep fr * across, end with ch 2, dc in last sc, ch 3, turn. Row 68 – 71: Rep Rows 8-11. Row 72: Sc in first dc, *[ch 3, sc in next 5-ch lp] twice, rep fr * across, end with ch 3, sc in third ch of last 5-ch turning ch, ch 1, turn. Evenly crochet an edging along the side of the piece by making 3 sc in each 3-ch turning ch/dc stem, and 1 sc in each sc. When you reach the bottom of the piece, make 3 dc in dc stem (this is the first Row of the piece), then in foundation ch make (sc, ch 1, sc). Continue working along the bottom hem (foundation ch) of the piece as follows: sc in each of next 2 ch, *picot, sc in each of next 3 ch, rep from * across, ending with (sc, ch 1, sc) in last ch. Continue working sc evenly along other side of the piece in a similar way as the first side. When you reach the last Row, work (sc, ch 1, sc) in the last sc, then finally, make the neckline trim as follows: sc in each of next 2 sc, *picot, sc in each of next 3 sc, rep from * across, ending with (sc, ch 1, sc) in last sc. Fasten off. Ch 350 to make tie for side seam of overdress. Weave the tie in corresponding holes along side of overdress joining Front and Back sides together. Start joining from the top (at the armpit) downwards, leaving Rows 1-26 unjoined. Make another tie for the other side of the overdress. Join yarn with sl st to corner of neckline at Front. Ch 50, fasten off. Tie to corresponding hole at corner at Back. Rep for the other shoulder strap.